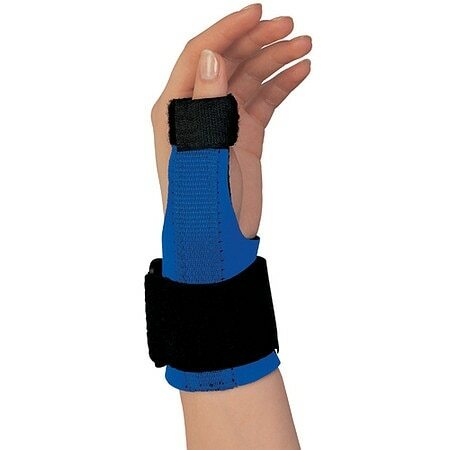 Champion Professional Neoprene Thumb Immobilizer1.0 ea. This thumb splint features a distinctive design that combines both ease of application and wearing comfort. It allows unrestricted movement in the fingers and preserves maximum function of the hand. This is an excellent choice to treat DeQuervain's Tendinitis, MCP joint sprains and strains, basal joint arthritis, and cumulative joint trauma. Contoured metal splint can be reshaped if necessary to enhance wearing comfort. Hook-and-loop fasteners permit easy, one-handed adjustment and closure. How to Measure: Measure around the break of the wrist. Small - wrist 4.75-6.0 in. Medium - wrist 6.0-8.0 in. Large - wrist 8.0-10.0 in.